"Election must be conducted in whichever way possible." President Kenyatta commands IEBC Chairman Chebukati. -#ElectionsKe - Bana Kenya News, Real African Network Tubanane. 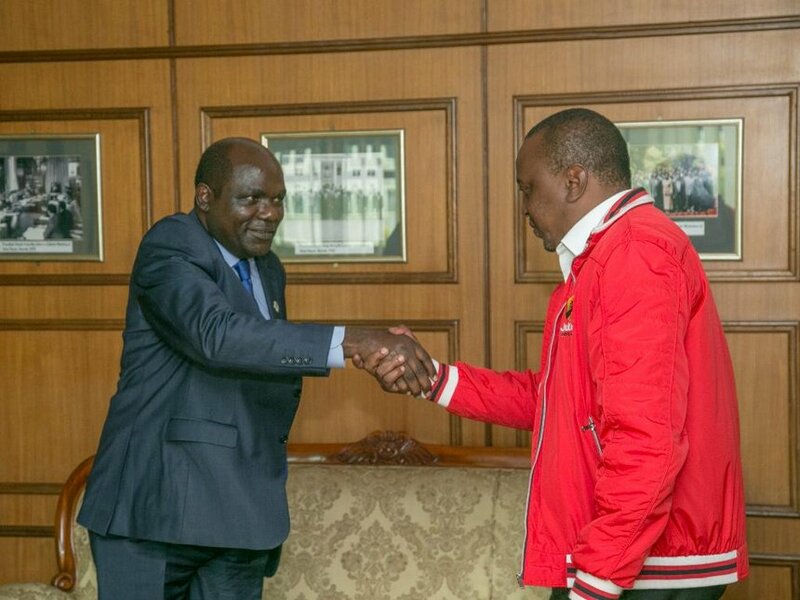 President Uhuru Kenyatta met the IEBC Chairman in an awkward move. The President expressed his fears of not having elections on 26th October 2017 citing that the country will plunge into a political crisis. He ordered the IEBC to conduct elections by any reasonable means. The President insisted that election will be there whether the IEBC chairman thinks the elections will not be credible. "Elections will there as long as my government has given you money to perform it otherwise those funds would have been used in empowering people in other projects." President Uhuru said. He urged the IEBC to shut down their ears and perform what took them to the office. The International convoy had a message to the Kenyans towards the elections. "When this election is held, Kenyans may choose to vote or not; to support whichever candidate they choose, or none; to express their views peacefully to whoever will listen, in whatever forum they think best. Now and after the election, we urge Kenyans to renew and redouble their national dialogue about how to unite the country, end the ethnic and tribal conflict, and allow everyone to share in the country’s bounty," the envoys said in a joint statement. President Uhuru Kenyatta insisted that No matter what will take to have the elections on 26th October 2017, his government will avail to avoid the political crisis. He commanded that election will be there on Thursday. “If we get 70+1 votes, will anybody question the legitimacy of my victory? Don't be misled by speculation. This time around, we will get 70+1 votes, whether Raila Odinga will be on the ballot or not,” Uhuru said. "There will be no dialogue with Raila until after elections. The government will not be formed in the boardroom. The people of Kenya will elect the government they choose," Uhuru said. “We only insist the election be held on October 26 ...," Kenyatta said. The IEBC Chairman Wafula Chebukati was confused over the President remarks about the Thursday polls. He was commanded to do elections in whichever way possible. “While it is his right, we must think beyond him and think of the six million Kenyans who will feel disenfranchised by this action. Do we just go on as if his withdrawal means nothing?” Chebukati asked. “I will not sit at the helm of the Commission as we plunge the country into a possibly worse situation than we had in 2007-08. It is difficult to guarantee a free, fair and credible election,” Chebukati said. “I have refused and said I am not interested in dialogue with Raila Odinga. I am interested in the decision of Kenyans. If you are tired with your work in the IEBC that is not the Problem. Elections must continue as planned. If he wants to lead this country, he must accept that leadership is granted by the people through voting,” Uhuru said. “We will talk later after voting. We will never talk on how to deny the people their democratic right to vote for their leader. Let the people decide.” Uhuru stated. The IEBC has been left with the burden of how the Elections will be conducted. The Jubilee government dedicated to providing all necessary tools and resources to make sure the Polls proceed as planned. This meeting comes just a few days ago where the IEBC Chairman threatened to quit. The decision for the two leaders to dialogue did not bore any fruits, further, he was forced to do the election in whichever means possible.